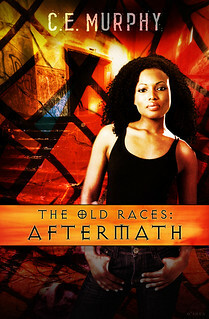 There will be 3 Old Races collections coming out in epub this summer. and may or may not have a 6th brand new story depending on how much I get done before the cover art comes in. The second, YEAR OF MIRACLES, is the novella that tells the story of Sarah Hopkins, the human woman that Janx and Daisani both fell in love with in the Year of Miracles–the year London burned. and at least one other brand-new story to fill the collection out. In theory these collections will be released in May, June and July, but that really depends on when I get the cover art. Print edition: Don’t hold your breath. It may eventually happen, but it’s not a near-term thing, and frankly, it probably depends on how well BABA YAGA’S DAUGHTER does from Subterranean Press, so if you haven’t pre-ordered that yet…do! Catie, will Year of Miracles patrons also get shiny epub/mobi files? Well. Yes. But I thought it might be a good idea to ask :).